Any form of job loss, particularly in the current job market, is a challenge for any individual. Whether a highly educated senior executive, or a trainee, being advised that you no longer have ongoing employment is a shock to the system. As a professional organisation, we work with many individuals that are facing redundancy, or have been made redundant. Many of these individuals go through the traditional stages of grief; however some have proven to be slightly more resilient throughout the process. There are a number of activities as well as perceptions that can help an individual move faster through the stages of grief following redundancy or during long term unemployment. First thing is first, what is a redundancy? The most important fact is to remember is that a redundancy is in no way a reflection of an individual’s capabilities or work abilities. A redundancy is purely an organisation needing to assess the ongoing employment structure in line with direction and strategy. If an individual was performing poorly, an organisation has other, easier and cheaper, alternatives to improve performance or disengage the employee. As a redundancy includes a financial severance package, an organisation does not use this as an opportunity to get rid of an employee, rather a position within an organisation. 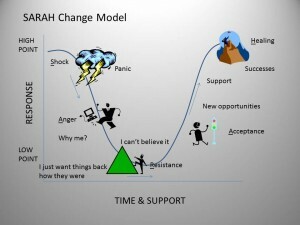 Traditionally, an individual will work through these stages at varying pace and will move backwards and forwards before reaching ‘Acceptance’ and ‘Help’. A lot of individuals will remain in the ‘Anger’ and ‘Resistance’ stages longer than the others and will transition with more difficulty before moving into acceptance. When an individual is able to identify and categorise the emotions that they are feeling more effectively, they have a greater result in proactively seeking possible alternative employment opportunities. It was part of a strategic plan for the organisation, not a reflection on my individual capabilities. It is imperative that following a redundancy you do not sit back for the entire period that was covered by any severance pay. Individuals that immediately start to seek employment, and are able to obtain a new role within this period, also receive the additional benefit of saving any remaining pay for their own personal use. Individuals that wait until they have used up any financial gain from their redundancy before seeking employment have been proven to increase their stress throughout the period which has had a negative impact on the application process. Understanding redundancy and the stages and emotions that you will go through throughout this period will support any individual when faced your own redundancy. Looking at this situation as a benefit to open your eyes to new opportunities, rather than a job loss, will ensure that you get the most out of the time. Many individuals use this time as an opportunity to look for their ideal career and how to transition across utilising their existing skills. If this is you engaging with a career professional to assist in how to achieve this is an ideal opportunity. By remaining positive and looking at all options as a result of your redundancy will ensure that you get the greatest and most suitable result for yourself and your career.